This tutorial will be for the tie that you see the Twins and Miku wear when they're wearing their Love is War outfits. It's actually quite easy. So easy that I'm not sure if I should post this tutorial. 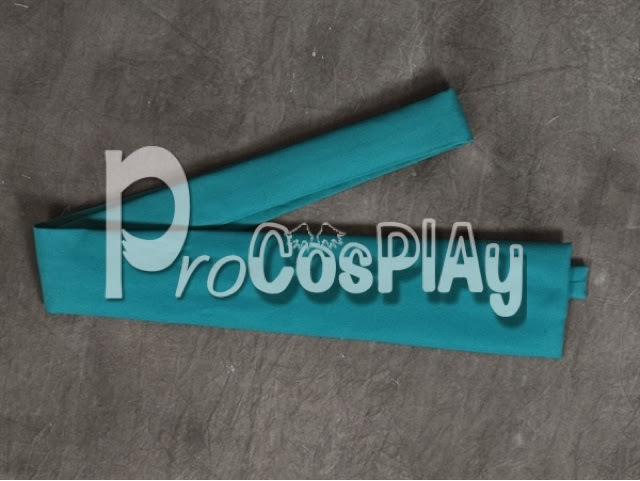 You can also use this tutorial for other tie needs for other cosplays. So here you go! STEP 3: First you're going to want to draw up your pattern. The shape should be a rectangle shape that is however long you want it to be but should be at least 20 inches long. One end of the shape should be 4 inches wide and the other 1-2 inches. Make sure to add 1/2-1 inch of extra fabric for seam allowance. Next, the shape needs to taper off evenly so you don't have a weird shape. :) After you draw up your pattern cut it out and pin it to your fabric. Then cut out the pattern so that you have two copies of your pattern. STEP 4: Take the two pattern pieces, pin them together and sew them. You'll want to not sew the thinner end first or else you'll have a weird looking tie. ^_^; Sew the other three sides first then turn the tie inside out, tuck in the ends of the open end, and sew it closed.